It’s easy to get caught up in the functional, and forget about the decorative. 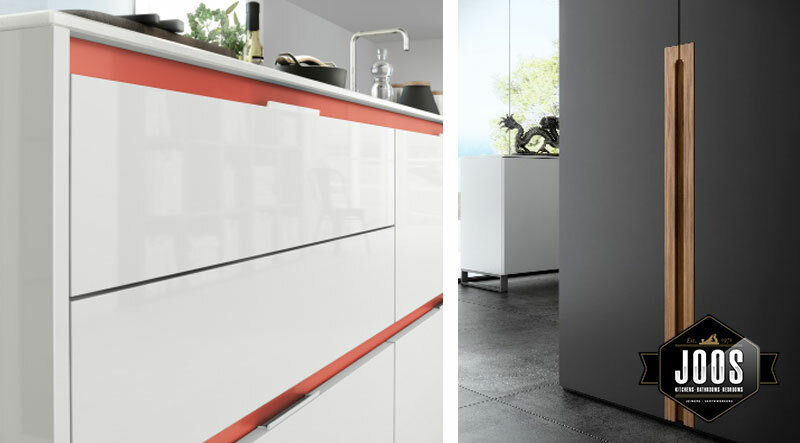 The simple addition of a accent colour on your cabinet fingergrip details can take the ordinary to the extraordinary. 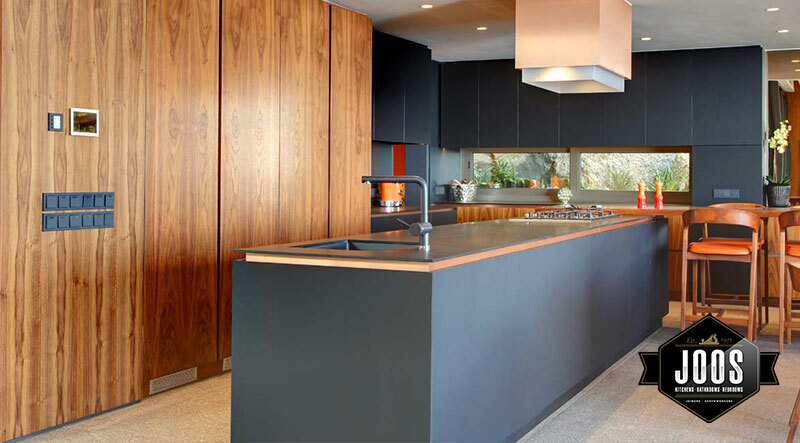 In the top picture the brass extractor is given weight by using the same material on the island – subtly recessed between the top and the cupboard below. When not in use this kitchen maintains a clean pared back look – industrial chic! BUT kitchens are dynamic spaces and when things kick into high gear additional counter space can be an absolute bonus. This cleverly designed unit on casters slides effortlessly back becoming part of the integrated cabinetry. Using a screen allows to create a focal point whilst keeping the open plan appeal of today’s homes. 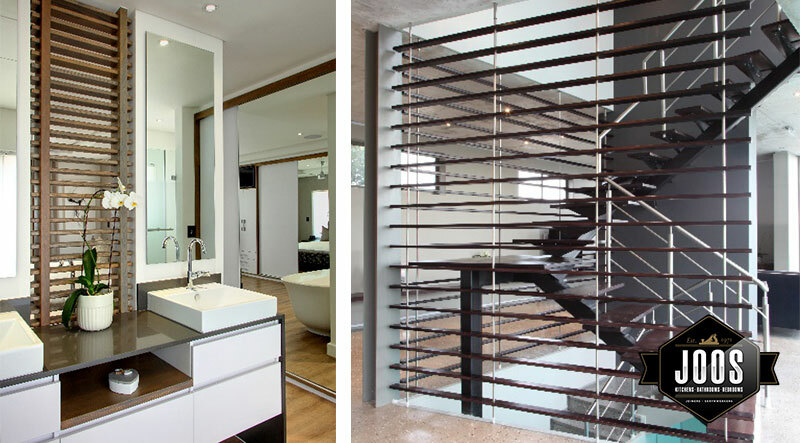 The screen in this bathroom (below left) keeps the room open and flows easily but also helps define the bathroom space. Open Sesame! 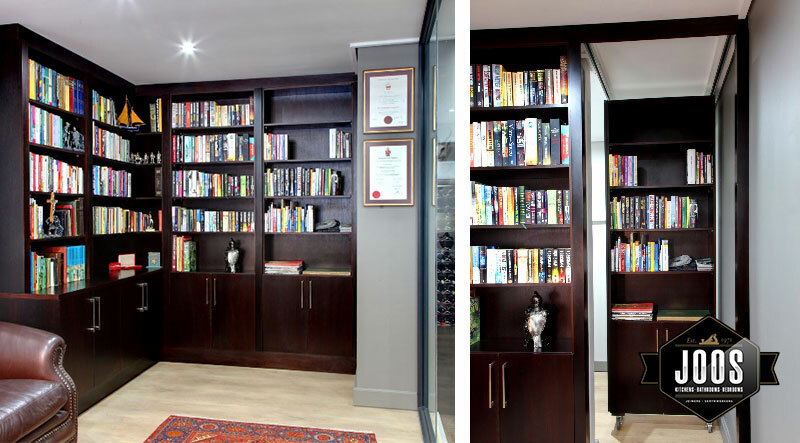 This homeowner wanted to conceal access to the study. Joos Joiners created a unit on caster with a grooved parallel track on the ceiling to ensure stability. No you see it and now you don’t. Double story homes are great- top floor provide privacy and often expose you to great views. Problem is that the kitchen / laundry are always located downstairs. 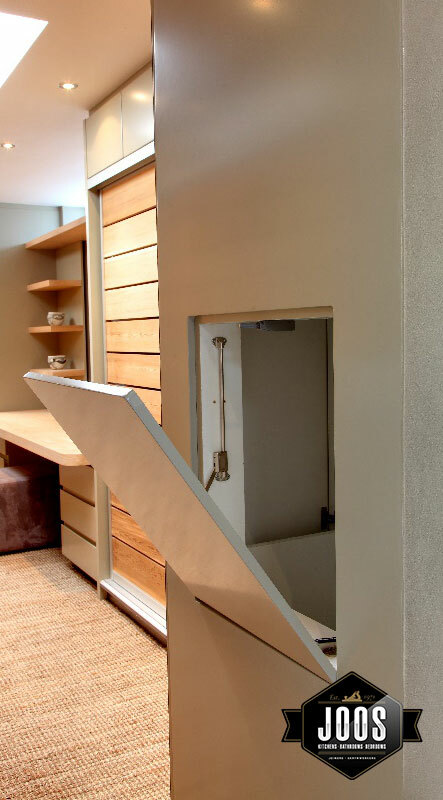 With careful planning a laundry shoot or dumb waiter channel can be planned in the early design stages. Your joiner can easily create a door that blends with other joinery but that conceals your connection between upstairs and downstairs. 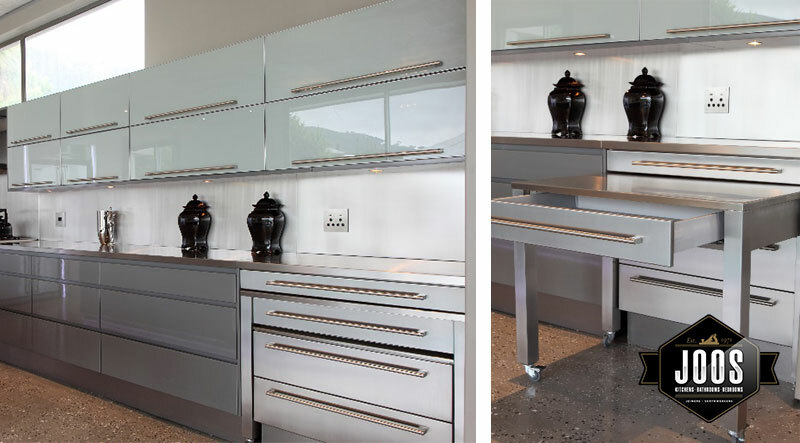 Break the monotony of floor to wall cabinetry in your kitchen / scullery. This kitchen had a large scullery that dog legged around the corner form the main kitchen. 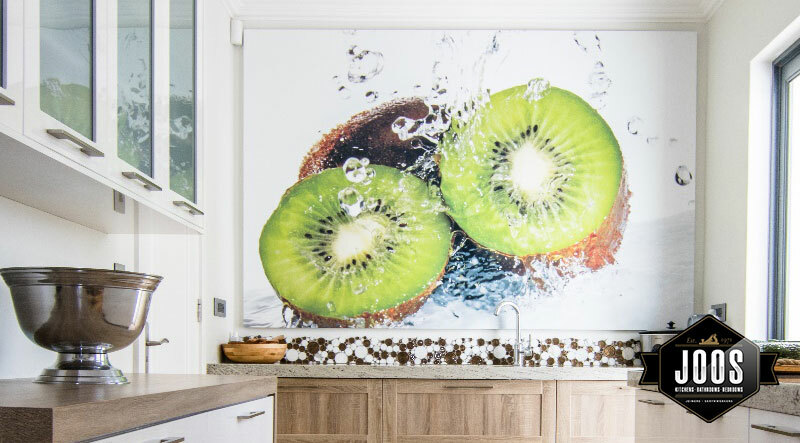 Rather than leave the back wall bare and featureless this homeowner selected an appropriate glass splashback that brightens the space and never fails to elicit a smile. 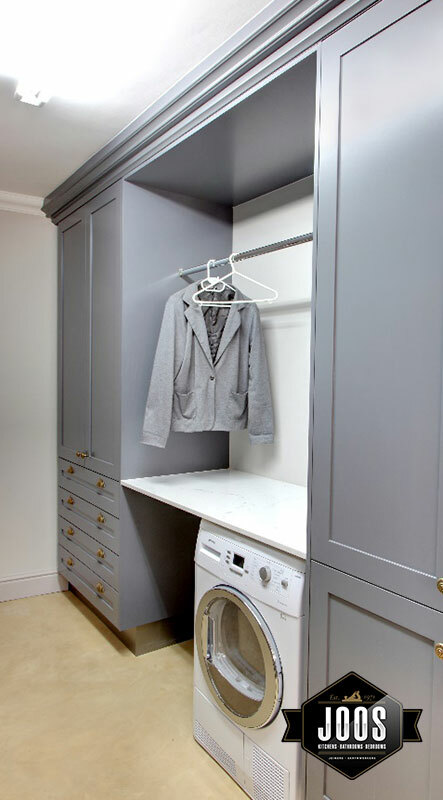 This cleverly design Laundry area gives huge flexibility. Cold Cape winters are not always ideal for drying laundry outside. Having a clothes rail like the one featured can be a total boon. Alternatively a clothing rail provides a perfect temporary storage area for ironed items before they are moved. The cupboards and drawers conceal ironing boards and Irons as well as detergents etc. Copyright © 2018 Joos Joiners. All Rights Reserved. Website Design by Digital Takeover.